How Important Is An Inheritance? One of the answer choices offered is “inheritance’’ and there was a wide range of responses from investors who state that the gift from a family member who passed on led to their current wealth level. For example, in Spectrem’s new age-based study Millennial and Generation X Investors: Attracting the Next Generations of Wealth, the answers ranged from 24 percent of Mass Affluent investors with a net worth below $1 million to 67 percent for those Ultra High Net Work Investors with a net worth above $5 million. The fact that wealthy investors are more likely to state that inheritance mattered in their current wealth level shows that a sizable inheritance can matter. But another Spectrem report indicates that inheritance is not the overriding factor in developing a strong financial portfolio. The Legacy: How Investors Are Impacted by Inheritance reveals that investors with at least $100,000 in net worth who received at least $100,000 in inheritance do not consider the sudden windfall to be a major factor in their life. Among those investors with a net worth between $100,000 and $1 million (not including the value of their primary residence) who received at least $100,000 in inherited money, the effect on their lifestyle rated as an average of 28.71 on a 100-point scale. That is surprisingly low, but not as low as those investors with $1 million or more in net worth who received in inheritance of $1 million or more (25.78). 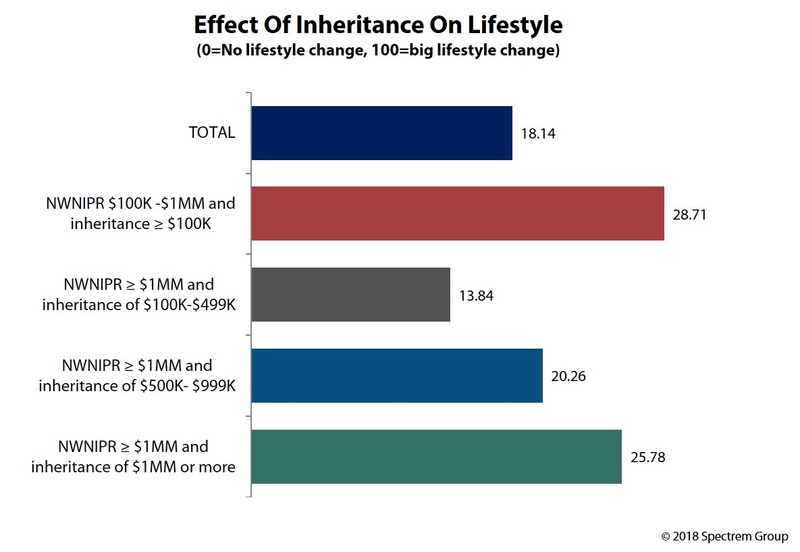 What this research shows is not that receiving an inheritance does not have a positive effect on one’s lifestyle. Rather, it shows that the effect is not overwhelming. Further research shows that most investors who receive a sizable inheritance just use it to expand their own investable assets category. Seventy-nine percent of investors said they invest at least a portion of their inheritance. Only 20 percent used a portion of their inheritance to pay down their debts. Again, not very effective from a lifestyle standpoint. Where an inheritance does seem to matter is in investor-advisor relationships. Many investors either started using a financial advisor upon receiving their inheritance (12 percent), switched advisors upon receiving their windfall (4 percent) or added the advisor who administered the inheritance to their team of advisors (3 percent). Still, 44 percent just kept their regular advisor, and 37 percent stated their intention to stay without an advisor. Among all inheritors, only 50 percent still have a relationship with the advisor who administered the inheritance. Eighty percent of investors said their inheritance was anticipated. Most of the inheritors had a certain level of affluence before they got their inheritance. The end result is that inheritance is beneficial but not significant in the overall standing of affluent investors. Advisors who administer estate plans and assist with wealth transfer have an opportunity to begin a new and long-term relationship with the inheritors. But the best chance is to work with inheritors who do not already have an advisor relationship. The other opportunity is when an investor is not overwhelmingly pleased with their current advisor and might see the new advisor as someone who has previously worked with a successful investor, namely the parent or grandparent who left the inheritance.